Breakfast is served at the edge of the caldera. That’s right, the volcano. Don’t worry, it’s extinct. Yellow-and-white tuff cliffs rise sharply up three sides of it. There’s a crescent-shaped beach at the end. The other side collapsed long ago; crystal water now spills into the Mediterranean Sea. While you sit in a natural amphitheater overlooking it all. The apricot-and-berry tart in front of you remains untouched; your cappuccino is now cold. With its rocky cliffs and turquoise water, this perfect scene looks like it’s on Santorini. But it’s more peaceful. There are no cruise ships blocking your view. Tenders aren’t ferrying people to and from the beach. Sure, there are sparkling white boats creating small shadows over the water. But they—in no hurry to move on—have been here longer than you. No, this is definitely not Santorini. You’re actually on the Italian island of Ponza. Most people have never heard of the little island in the Tyrrhenian Sea. Ponza, one of the six Pontine Islands, is off the west coast of Italy in between Rome and Naples. It was named after a Roman governor, abandoned during the Middle Ages, and captured by the British during the Napoleonic Wars. Benito Mussolini created a prison for political dissenters here in the early 20th century; he was later imprisoned here himself after being overthrown and arrested in 1943. Romans have somehow managed to keep the island under the radar ever since. You arrived on Ponza on a hydrofoil from Anzio. From the ferry, you could see tiny vineyards, secluded beaches, and hidden grottos. Porto, the port and only town, is lined with candy-colored houses on one side and small boats on the other. Boat building and repair, along with fishing, dominate the economy. A single, two-lane road runs from north to south. It passes Greek and Phoenician ruins, marble statues, and chicken coops. It also leads to Hotel Chiaia Di Luna. 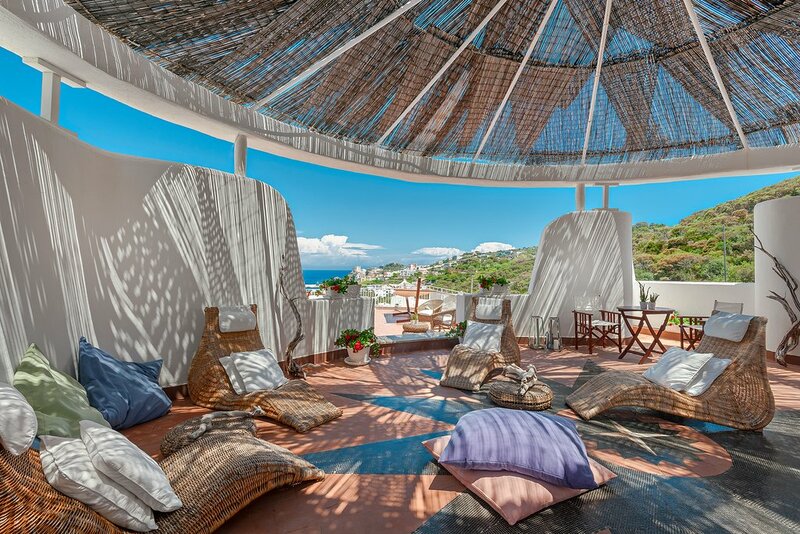 Hotel Chiaia Di Luna probably sits on the best spot on Ponza. The all-white hotel is built into the hillside. Its restaurant overflows onto a spacious terrace and is dotted with wicker loungers, canvas chairs, and oversized pillows. They all overlook the pool. There’s a bar, whose couches seem to hang over the cliff. Only the small rooms are in need of upgrades. But you won’t be spending much time in yours anyway. Instead, you’ll spend the day by the pool and stare at the breathtaking view. You’ll sip Pontine Mojitos, made with fennel instead of mint, as aperitivos during sunset. Then you’ll stuff yourself with albacore, yellowtail, scialatielli—served with clams, fried zucchini, and mild caciocavallo cheese—and a fruity Fieno di Ponza wine by candlelight for dinner. You’ll quickly not only understand, but fully embrace, what Italians call la dolce vita. 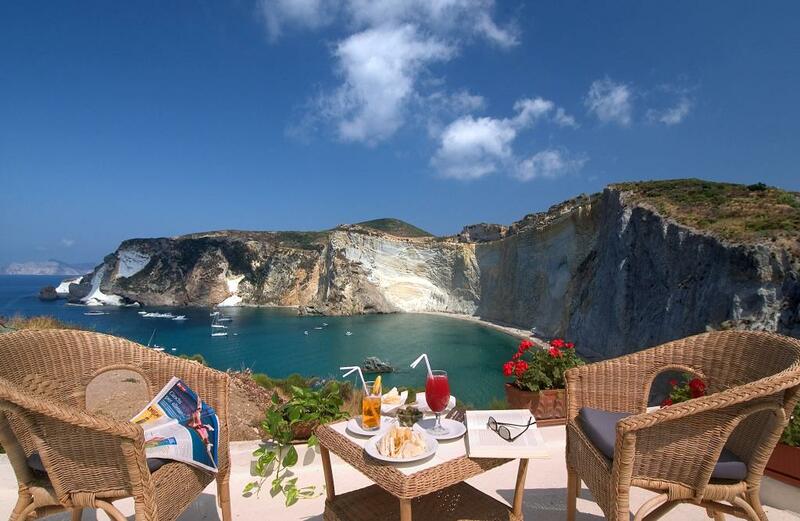 Ponza is now your secret place, too.